by Patrick Dillon and Matthew Komelski, Ph.D. 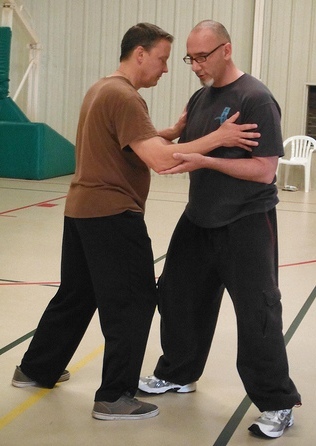 Authors Patrick Dillon (left) and Matthew Komelski playing push-hands at summer camp. Friends or family members suffering from neck pain? Taiji may be able to help. A recent study, in the American Pain Society’s Journal of Pain featured a report on a large randomized controlled trial by Romy Lauche and colleagues involving 114 participants with chronic neck pain. The purpose of the study was to compare Taiji to a standard neck exercise treatment and a non-treatment (waitlist) control group. The Taiji protocol for the study involved a 13-movement variation of Yang Style Taiji sandwiched between 5-10 minutes of warm-ups and relaxation exercises. Participants met once weekly for 75-90 minutes of practice and were encourage to practice at least 15 minutes a day. Both Taiji and the standard exercise treatment emphasized paying attention to bodily sensations related to postural awareness and correction. The study found that Taiji and neck exercise were comparable in their treatment effects and that both provided significant relief over the control. Although the original study was not able to provide a data-driven explanation for how Taiji improved chronic neck pain, a secondary analysis on data from the same study, slated for publication later this year in the journal SPINE, was able to determine significant associations between reduction in pain and improvements in anxiety and self-reported postural awarenessspecifically, pain reduction correlated with greater wellbeing and a more effortless awareness of posture. Lauche R, Stumpe C, Fehr J, Cramer H, Cheng YW, Wayne PM, Rampp T, Langhorst J, & Dobos G. The Effects of Tai Chi and Neck Exercises in the Treatment of Chronic Nonspecific Neck Pain: A Randomized Controlled Trial. J Pain. 2016 Sep;17(9):1013-27. doi: 10.1016/j.jpain.2016.06.004. Epub 2016 Jun 23.